v. the method of preventing or management the diseases and reducing the losses/damages caused by diseases. The normal physiological functions of plants are disturbed when they are affected by pathogenic living organisms or by some environmental factors. Initially plants react to the disease causing agents, particularly in the site of infection. Later, the reaction becomes more widespread and histological changes take place. Such changes are expressed as different types of symptoms of the disease which can be visualized macroscopically. As a result of the disease, plant growth in reduced, deformed or even the plant dies. When a plant is suffering, we call it diseased, i.e. it is at ‘dis-ease’. Disease is a condition that occurs in consequence of abnormal changes in the form, physiology, integrity or behaviour of the plant. Disease is a deviation from normal functioning of physiological processes of sufficient duration or intensity to cause disturbance or cessation of vital activities. A plant is diseased when it is continuously disturbed by some causal agent that results in abnormal physiological process that disrupts the plants normal structure, growth, function or other activities. This interference with one or more plant’s essential physiological or biochemical systems elicites characteristic pathological conditions or symptoms. (ix) Abnormality in soil conditions (acidity, alkalinity). a. Disease caused by parasitic organisms: The organisms included in animate or biotic causes can incite diseases in plants. b. Diseases caused by viruses and viroids. The factors included in inanimate or abiotic causes can incite such diseases in plants under a set of suitable environmental conditions. 1. Parasite: An organism living upon or in another living organism (the host) and obtaining the food from the invading host. 2. Pathogen: An entity, usually a micro-organism that can cause the disease. 3. Biotroph: A plant pathogenic fungus that requires living host cells i.e. an obligate parasite. 4. Hemibiotroph: A plant pathogenic fungus that initially requires living host cells but after killing the host cell grows on the dead and dying cells. 5. Necrotroph: A pathogenic fungus that kills the host and survives on the dying and dead cells. 6. Pathogenicity: The relative capability of a pathogen to cause disease. 7. Pathogenesis: It is a process caused by an infectious agent (pathogen) when it comes in contact with a susceptible host. 8. Virulence: The degree of infectivity of a given pathogen. 9. Infection: The initiation and establishment of a parasite within a host plant. 10. Primary infection: The first infection of a plant by the over wintering or over summering of the pathogen. 11. Inoculum: That portion of pathogen which is transferred to plant and cause disease. 12. Invasion: The penetration and spread of a pathogen in the host. 13. Colonization: The growth of a pathogen, particularly a fungus, in the host after infection is called colonization. 14. Inoculum potential: The growth or threshold of fungus available for colonization at substratum (host). 15. Symptoms: The external and internal reaction or alterations of a plant as a result of disease. 16. Incubation period: The period of time between penetration of a pathogen to the host and the first appearance of symptoms on the plant. 17. Disease cycle: The chain of events involved in disease development. 18. Disease syndrome: The set of varying symptoms characterizing a disease are collectively called a syndrome. 19. Single cycle disease (Monocyclic): This type of disease is referred to those caused by the pathogen (fungi) that can complete only one life cycle in one crop season of the host plant. e.g. downy mildew of rapeseed, club root of crucifers, sclerotinia blight of brinjal etc. 20. Multiple cycle disease (Polycyclic): Some pathogens specially a fungus, can complete a number of life cycles within one crop season of the host plant and the disease caused by such pathogens is called multiple cycle disease e.g. wheat rust, rice blast, late blight of potato etc. 21. Alternate host: Plants not related to the main host of parasitic fungus, where it produces its different stages to complete one cycle (heteroecious). 22. Collateral host: The wild host of same families of a pathogen is called as collateral host. 23. Predisposition: The effect of one or more environmental factors which makes a plant vulnerable to attack by a pathogen. 24. Physiologic race: One or a group of microorganisms similar in morphology but dissimilar in certain cultural, physiological or pathological characters. 25. Biotype: The smallest morphological unit within a species, the members of which are usually genetically identical. 26. Symbiosis: A mutually beneficial association of two or more different kinds of organisms. 27. Mutualism: Symbiosis of two organisms that are mutually helpful or that mutually support one another. 28. Antagonism: The counter action between organisms or groups of organisms. 29. Mutation: An abrupt appearance of a new characteristic in an individual as a result of an accidental change in genes present in chromosomes. 30. Disease: Any deviation in the general health, or physiology or function of plant or plant parts, is recognized as a disease. 31. Cop Damage: It is defined as any reduction in the quality or quantity of yield or loss of revenue resulting from crop injury. 32. Deficiency: Abnormality or disease caused by the lack or subnormal level of availability of one or more essential nutrient elements. Physiological malfunctioning of the host cells causes disturbances in chemical reaction which ultimately lead to some structural changes viz., overgrowth, phyllody(abnormal development of floral parts into leafy structures), sterile flowers, hairy roots, witches broom, bunchy top, crown gall, root knot, leaf curling, rolling, puckering etc. i. Disintegration of the tissues by the enzymes of the pathogen. ii. Effect on the growth of the host plant due to growth regulators produced by the pathogen or by the host under the influence of the pathogen. iv. Abnormality in respiration of the host tissues due to disturbed permeability of cell membrane and enzyme system associated with respiration. v. Impairing the phenomenon of photosynthesis due to loss of chlorophyll and destruction of leaf tissue. vi. Effect on the process of translation and transcription. Wilt: Withering and drooping of a plant starting from some leaves to growing tip occurs suddenly or gradually. 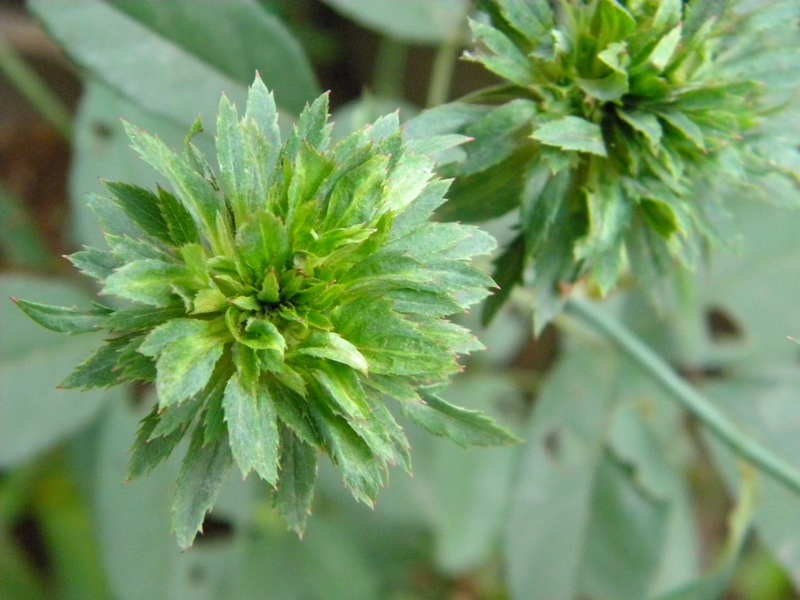 Wilting takes place due to blockage in the translocation system caused by the pathogen. Rusts: Numerous small pustules growing out through host epidermis which gives rusty (rust formation on iron) appearance of the affected parts. Colour change: It denotes conversion of green pigment of leaves into other colours mostly to yellow colour, in patches or covering the entire leaves. (ii) Chlorosis: Yellowing due to infection viruses, bacteria, fungi, low temperature lack of iron etc. (iv) Chromosis: Red, purple or orange pigmentation due to physiological orders etc. (ii) Hypertrophy: abnormal increase in size or shape due to excessive enlargement of the size of cell of a particular tissue. Atrophy: It is known as hypoplasia or dwarfing which is resulted from the inhibition of growth due to reduction in cell division or cell size. Sudden outbreak of a disease within a relatively short period covering a large area and affecting many individuals in a population is called epidemic. Although, this term was originally designated to the human diseases, now applied in the diseases of animals, poultry, plants etc. Epidemic form of plant diseases is called as epiphytotics. For a disease to occur, coincidence of three parameters of disease triangle is essential, namely, the vulnerable host, virulent pathogen and favourable environment. Under such circumstances, the pathogen not only completes its life cycle but also undergoes repeated generations. Then an epidemic develops only when few repeated generations are completed by the pathogen on the same host. As each generation or cycle of the pathogen takes a few days for completion, the fourth parameter i.e. time factor (forms a disease tetrahedron or disease pyramid) is also involved in epidemic build up. In other words, epidemic growth is both temporal (pertaining to time) and a spatial (relating to space or area) process. The initial stages of an epidemic growth curve have a lag phase, when the incubation period is longer, inoculum load is weak and prevalent environmental conditions are unfavourable. Subsequently, when the conducive conditions occur, the growth of the disease is rapid and the severity of the epidemic explodes like a time bomb. Later, severity declines either due to unfavourable weather or crop maturity or both. 1. Avoidance of the pathogen: Occurrence of a disease can be avoided by planting/sowing a crop at times when, or in areas where, inoculum remain ineffective/inactive due to environmental conditions, or is rare or absent. 2. Exclusion of the pathogen: This can be achieved by preventing the inoculum from entering or establishing in a field or area when it does not exist. Legislative measures like quarantine regulations are needed to be strictly applied to prevent spread of a disease. 3. Eradication of the pathogen: It includes reducing, inactivating, eliminating or destroying inoculum at the source, either form a region or from an individual plant (rouging) in which it is already established. 4. Protection of the host: Host plants can be protected by creating a toxin barrier on the host surface by the application of chemicals. 5. Disease resistance: Preventing infection or reducing the effect of infection of the pathogen through the use of resistance host which is developed by genetic manipulation or by chemotherapy. 6. Therapy: Reducing severity of a disease in an infected individual. The first five principles are prophylactic (preventive) procedure and the last one is curative.